After a 24-year career in the US Air Force and moving every few years to different places around the country and the world, we found our perfect little dream spot and settled down in the Shenandoah Valley of Northern Virginia. Tim spent the last 10 years working as branch chief for the Department of State and now, recently retired, he and Donna work full time around the farm. When we bought our property in 1998 we thought it would be nice to raise some sort of livestock to make the most of the pasture. We toyed with different ideas. As Donna had been a city girl and an animal lover all of her life, she could not deal with the idea of raising and caring for any animal that was going to end up being on the dinner table. So we looked into cashmere goats, alpacas, peacocks (boy, are the neighbors glad we passed on that one) and llamas. After doing preliminary research on various animals, it was the llamas that caught our attention. We were intrigued by their calm demeanor and stately presence, not to mention those dreamy eyes and cute wooly faces. Then Donna read an article in a magazine about a business that was offering hikes in the mountains with llamas packing in a picnic lunch. 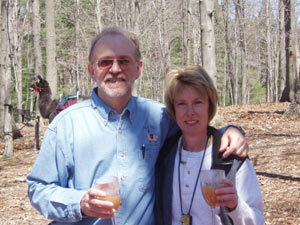 As a surprise for Tim’s 50th birthday, she planned a trip to do a llama trek in NC with several friends. The big light bulb came on. Here we are in the Blue Ridge Mountains with the magnificent Shenandoah River running nearby. We love to hike and we enjoy meeting people that share our interests. Why couldn’t we do the same thing? So the process began. 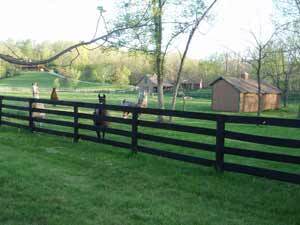 We visited many llama farms in our area, read all the books we could get our hands on, went to llama shows and conferences, all while having a barn built and fencing installed to accommodate our new llamas when we brought them home. Our first three llamas were delivered in November 2001 and our lives have been fuller and richer ever since. We are dedicated to providing you a quality hiking experience with lots of fun and personal attention. We enjoy what we do and look forward to sharing our enthusiasm, knowledge and love of llamas with you.